Variations displays together 3 videos from the Interior Landscapes series: Ground control, Facilities area and Art fair. In a white room with a white ambient light, tree films are projected. The ambient light intensity is proportionally tied to real-time global market information. The Interior Landscape films have in common a definite nature of the environment and the events, where individuals appear to be following the only possible path. New architectures are suggested from imaginary extrapolations of the original film shots. 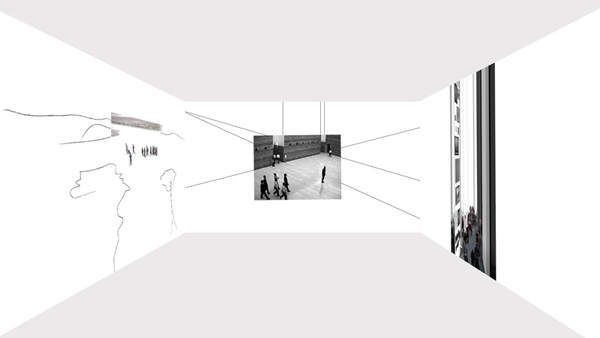 The character of these spaces magnifies the choreographic impression given by the action. The light being controlled by the financial quotes will put forward the interpretation of this piece as a comment on the tyrannical power of international finances. Interior square of a building, artificial light. People appear to be coming or going to work or from the services areas. There is also a standing sculpture of a man, same scale. The whole space is suspended over thin treads. The video moves inside, hesitating. It is a foggy day in a place which appears to be an airport. People are running or walking with bags, there is a controller guiding them. 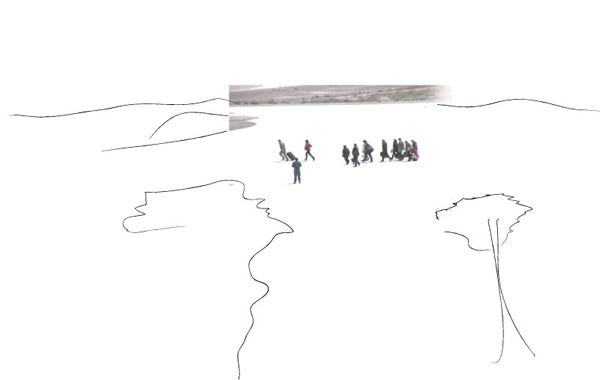 It might be an evacuation… The landscape hors-champ is suggested by drawings and the video moves inside, hesitating. A flood of persons visit an art fair, the ceiling is abnormally high.